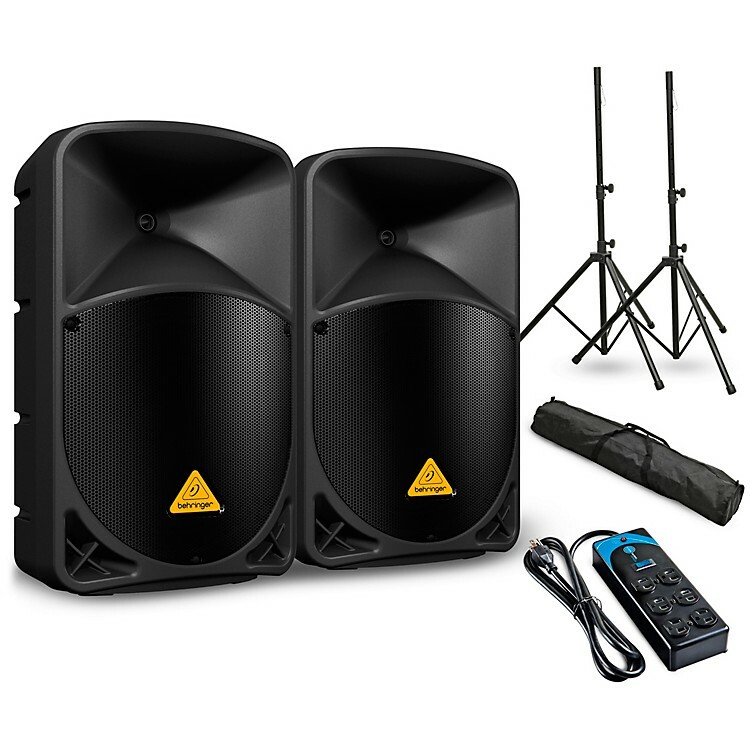 The EUROLIVE B112MP3 active loudspeaker is exactly what you™ve come to expect from BEHRINGER” more power, more features and absolutely more affordable! Our engineers have really outdone themselves, creating a self-contained PA solution that merges state-of-the-art, 1,000-Watt Class-D power amp technology with an integrated 2-channel mixer, built-in wireless microphone capability, a high performance MP3 player and exceptional portability. This professional active loudspeaker is destined to become a legend in its own right, alongside the other EUROLIVE models that make BEHRINGER known worldwide for their active loudspeakers. Thanks to Behringer's revolutionary Class-D amplifier technology, they are able to provide you with enormous power and incredible sonic performance in an easy-to-use, ultra-portable and lightweight package. Class-D amplification makes all the difference, offering the ultimate in energy efficiency and eliminating the need for heavy power supplies and massive heat sinks. This amazing technology makes it possible to design and build extremely powerful products that are significantly lighter in weight than their traditional counterparts, while using less energy and protecting the environment. Get wireless-ready with the built-in, dedicated connectivity of Behringer ULTRALINK ULM Series wireless microphone system (to be ordered separately). Wireless gives you maximum freedom and mobility without the need to run cables. The highest-quality sound is provided thanks to the ULM™s digital, license-free 2.4 GHz frequency spectrum. The ULM wireless system combines professional-quality sound with simple setup and an intuitive interface for legendary audio performance right out of the box. Just plug in the ULM receiver œdongle, and instantly you have an exceptional wireless mic system. Freeing you from cables is the simply easy way to own the stage. The integrated 2-channel mixer features the same ultra low-noise, high-headroom mic preamps that have made BEHRINGER mixers legendary, and the individual Mic/Line inputs accept virtually any level signal you'e likely to run across. Variable Input gain controls (with Clip LED) will have you dialing in the perfect level every time. And if you need more coverage, use the convenient Link Output XLR connector to add more active loudspeakers. With its 1,000 ultra-clean Watts of digital output delivered through separately powered drivers, courtesy of true bi-amping (2 amplifiers per speaker system), the B112MP3 deliver high-resolution sound that really brings out the best in your music. While some of our competitors apply simple passive crossovers, which inaccurately separates the frequency spectrum and degrade driver performance, BEHRINGER has gone the extra mile “ driving each woofer and tweeter with a separate amplifier for absolute signal integrity. Powerful, high-efficiency Class-D amplifiers and Switch Mode Power Supply technology coupled with state-of-the-art DSP functionality sure sounds impressive”but what about the part of the system you actually hear? Behringer's LF (Low Frequency) and HF (High Frequency) transducers are designed specifically for each application. When you buy a BEHRINGER active loudspeaker, you can rest assured the transducers inside have been engineered to perform flawlessly with every other element for truly professional results. The B112MP3 active speaker system cranks out massive quantities of low end, with articulate, detailed mids and crystal-clear highs. Thanks to their trapezoidal shape, the B112MP3 is suitable for a wide variety of applications. It can be mounted on standard speaker poles, placed vertically atop subwoofers, or even laid on their side for use as onstage monitor wedges. It™s extraordinary fidelity and frequency response make the B112MP3 a favorite of vocalists and instrumentalists alike. Hook up is simple, requiring only a single XLR or ¼ " cable from your mixing console and power. Additional monitors can be chained together via the XLR Link Output jack on the rear panel.